Approximately 2,500 years ago, Siddhartha, a prince of the Shakya clan in northern India, abandoned his royal heritage to seek the source of human suffering. Siddhartha grew up in the greatest luxury that his time could provide, sheltered by an overly protective father who wanted his son to succeed to the throne. Not until his twenties did the prince venture beyond the palace grounds. His illusions about life were quickly shattered as he encountered illness, old age, and death among his subjects. Soon afterward, Siddhartha saw an old religious mendicant who was utterly present and at peace. How could that be? How could anyone be at peace in the midst of all that suffering? No matter how we grow up, in wealth or poverty, in love or adversity, we form a view of life. Everything we do subsequently is based on the belief that that view of life is how things are. Perhaps you grew up in an environment in which you could easily trust everyone not to hurt you, but then you encounter a person who, for no reason you can imagine, is intent on doing you harm. Perhaps you grew up learning to trust no one and can’t imagine trusting another person with anything that is important to you. We first encounter the mystery of being when our view of life is called into question. All too often, we react by ignoring, closing down, manipulating, or controlling what arises in experience to avoid questioning that view of life and what we feel we are. Siddhartha could not simply ignore what he had seen. Power, wealth, and position became meaningless to him in the face of illness, old age, and death. His conception of life and what he was were turned upside down and inside out. He saw another possibility, however, in the presence and peace of the religious mendicant. The first encounter with the mystery of being momentarily shatters the structures of ordinary life. When everything falls away, a moment of opening takes place. In that moment, we are free – free from the fetters of beliefs and ideas about who and what we should be. In other words, in the midst of the destruction of our illusions about life, we experience being what we actually are – free, open awareness. Most of the time, we don’t notice that freedom and open awareness. We’re too busy putting our view of life back together. Even if we do notice it, we don’t stay there for long. But we have, like Siddhartha, encountered the religious mendicant and the possibility of presence. Siddhartha soon left the court life he knew to examine the issue of suffering. Why is there suffering? Where does it come from? His first step was to turn to the religious teachers of the day. He quickly learned everything they had to teach: their philosophies, meditation techniques, and codes of conduct. He practiced what he was taught, and he gained abilities equal to those of his teachers. Yet his questions remained unanswered. The mystery of being often makes itself felt in our lives in the form of questions. We turn to institutions, traditions, and respected teachers, hoping to find answers to our questions. We study and practice, learning much that is helpful. When we really listen to our own questions, however, we know that we can never receive answers to them from an institution, tradition, or another person. The answer can come only through our own experience. At some point, we take what we have learned and apply it to our own questions. We have to make the practice our own. Along with five companions, Siddhartha began a life of extreme asceticism in order to understand the source of human suffering. Tradition records that for six years he ingested only one sesame seed, one grain of rice, and one drop of water per day. When they discover that their approach to life is based on an illusion, many people react by pursuing wealth and power. In pursuing asceticism, Siddhartha was taking an approach to life that was the opposite of the one that most people adopt. He had learned that wealth and power were meaningless. Perhaps the answers to his questions could be found in poverty and austerity. Whether we pursue wealth or austerity, our lives are still based on the same conditioning; it’s just running in the other direction. Which direction the conditioning runs makes no difference. Like a train that has been going the wrong direction, we stop, turn around, and go the opposite way, but we are running on the same tracks. The same ideas and assumptions are still operating. To enter the mystery of being, we have to step off the tracks. After six years of starving himself, Siddhartha could no longer keep his mind clear. He concluded that the practice of asceticism for its own sake would not lead him to understand suffering. Siddhartha stopped his regimen and began to eat normally, despite being rejected by his companions. With his body restored, he sat under a tree and resolved not to move until he understood the source of suffering. He let his mind rest in attention, undistracted, not trying to make anything happen, not trying to cultivate any particular quality or ability. He stopped everything and simply sat with his question: what is the source of suffering? How do we step off the tracks? We stop trying to avoid, close down, manipulate, or control what arises in experience. When we do stop, we are inevitably regarded with suspicion, and even rejected, by those who continue to live their lives based on patterns and conditioning. We go forward alone. That evening Siddhartha entered progressively deeper states of attention. The traditional accounts describe how Mara, the demon of obsession, tried to distract Siddhartha and bring him back into the realm of reaction and confusion, where Mara held sway. He first tried to distract Siddhartha with desire by sending his daughters, in the form of beautiful women, to seduce him with affection, relationships, and sexual pleasure. Understanding that all experience, no matter how pleasurable, comes and goes, Siddhartha remained in attention. Mara tried anger next, sending armies of demons to the attack. Siddhartha saw the demonic armies as the play of mind, so the rain of weapons arose in his experience as a rain of beautiful flowers. Siddhartha then saw that the source of suffering was emotional reaction to what arises in experience. He saw that reactivity is based on the misperception that the “I” exists apart from experience. When he saw through the misperception, it dissolved completely. In that moment, Siddhartha became a Buddha, a person who has awakened from the sleep of unawareness and reactive patterning. To wake up is hard. We must first realize that we are asleep. Next, we need to identify what keeps us asleep, start to take it apart, and keep working at dismantling it until it no longer functions. As soon as we make an effort to wake up, we start opening up to how things are. We experience what we have suppressed or avoided and what we have ignored or overlooked. When that happens, the reactive patterns that have run our lives, kept us in confusion, distorted our feelings, and caused us to ignore what is right in front of us are triggered. They rise up strongly to undermine the attention that is bringing us into a deeper relationship with what we are and what we experience. When we can see those patterns and everything that is constructed out of them as the movement of mind and nothing else, we begin to wake up. Mara had one final challenge for him and demanded an external validation of his experience. Buddha Shakyamuni smiled, touched the earth, and said, “The earth is my witness.” That was the end of it. The final challenge of habituated patterns is to question direct experience. How do we know? How can we trust this knowing, which is totally beyond the ordinary conditioned experience of life? Like Buddha Shakyamuni, we turn to no external reference and live in the knowing. We rest in presence, in the very mystery of being itself. After his awakening, Buddha Shakyamuni spent the next seven weeks quietly digesting what had happened. His initial assessment was that no one else could possibly understand what he had discovered. Eventually, however, the Buddha decided he had a responsibility to try to communicate his understanding to others. He set off for Benares, a major city a few miles away. When we see how things actually are, our whole system experiences a profound shock. We are not what we thought we were. All our struggles to define who and what we are are revealed as pointless, fruitless, and self-defeating. At first, we have no idea what to do or how to function, but we are still breathing. Life goes on, but now what? Our natural human impulse is to share our knowledge and understanding with others. This impulse manifests in life as compassion, which is a response to the circumstances of the moment. In the village of Sarnath, a suburb of Benares, Buddha encountered his companions in asceticism. At first, they didn’t want to have anything to do with him and resolved to ignore him. As Buddha approached, however, they felt an extraordinary presence and spontaneously rose to greet him. They were so awed by his presence that they asked him to explain what had happened. Buddha Shakyamuni started with the existence of suffering and explained what he now knew. For Buddha, the circumstance of the moment was this chance meeting with his former companions. All of them had been motivated originally by the question of suffering, so he gave his first teaching, the four noble truths. Stated baldly, the four truths seem a bit enigmatic. They are, in fact, based on a simple problem-solving model, a model that dates far back in Indian philosophy and medicine. The first noble truth is the truth of suffering: there is suffering. Suffering is the central problem of human experience. 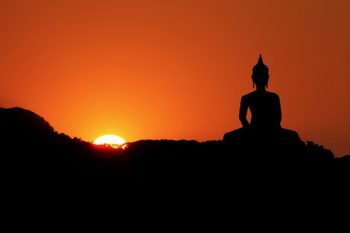 Buddha did not ignore suffering or try to explain it away as an unfortunate side effect of a divine plan or cosmic order. Suffering was, for him, the central issue. And it is still the central issue for us today. So, what is suffering? The Sanskrit term is dukkha, a term that refers to the unsatisfying quality of experience. It is a general term that covers everything from vague feelings of unease to extreme physical and emotional anguish. Suffering, as it is used in the first noble truth, refers to any sense of discomfort. We all experience discomfort, whether it is the slight uneasiness of embarrassment or the intense pain of bone cancer. When discomfort arises, our first impulse is to put an end to it, to stop it any way that we can. We are, in effect, trying to separate ourselves from what we are experiencing and, by doing so, separating ourselves from life and from the mystery of being. The first noble truth is basically an injunction not to ignore or dismiss what we experience. The first noble truth says that suffering is pervasive. It invites us not to ignore or avoid it, but to look at it, know what it is, and understand how it arises. Buddha Shakyamuni’s second insight involves the origin of suffering. Suffering comes from emotional reactivity. All experience is pleasant, unpleasant, or neutral. The three fundamental emotional reactions to experience are attraction, aversion, and dullness or indifference. Attraction is the emotional reaction to what is pleasant. Aversion is the reaction to what is unpleasant. Indifference is the reaction to what is neutral. The three reactions are called the three poisons because they poison our experience of life. They are often symbolized in Buddhist iconography as a rooster, a snake and a pig. The second noble truth tells us that the origin of suffering is emotional reactivity. What do we do to end this suffering? We dismantle the patterns of emotional reactivity. Is it possible to disengage from reactivity? The third noble truth is Shakyamuni’s powerful answer, yes. He saw that the sense of self, of “I,” is the basis of emotional reaction, and that “I” as a real entity doesn’t exist. In other words, when the conditioning that underlies the sense of separation, the false duality of subject and object, is dismantled, suffering ceases. “It doesn’t exist: even buddhas do not see it. It doesn’t not exist: it is the source of all experience. This isn’t a contradiction: this is the middle way! We cannot and do not end pain, but we can and do end suffering. We end suffering by ceasing to identify with what we are not: a pattern that interprets experience as separate and other and then strives to justify its own imagined existence. Buddha Shakyamuni could say unequivocally that there is an end to suffering because he developed such a high level of attention, diamond-like attention, that he could rest in the mystery of being, the experience of not existing as a separate entity, with no fear and in complete clarity. At that level of attention, the experience of not existing as a separate entity is known for what it is and ceases to be a basis for fear and emotional reactivity. The key effort in the third noble truth is to come to this understanding ourselves. Suffering ends when we have sufficient ability in attention to be present in all experience — even the experience of not being a separate entity. In the fourth noble truth, we are introduced to the path, the way of life, that leads to freedom from suffering and the reactive patterns that generate it. Reactive patterns have been in place for a long time. Much of life is the product of their operation. To dismantle these patterns we must take apart our lives. Attention works to dismantle patterns the way the energy of the sun melts ice. The directed energy of attention dissolves the structure of patterns, releasing the energy locked in them. We experience the freed energy as awareness and presence. To cultivate and apply attention, we travel the eightfold path: right speech, right action, right livelihood, right effort, right mindfulness, right attention, right view, and right cognition. In the context of the eightfold path, “right” does not mean right as opposed to wrong. The path is not a prescription for behavior that is deemed “right” by any authority. An action is right, in terms of the eightfold path, when the action comes from attention and presence rather than from reaction. How, for instance, do we practice right speech? Right speech does not mean saying “the right thing.” Ideas about the “right” thing usually come from conditioning. As a teacher, I field a lot of questions from students about different aspects of practice. Many are repetitive. I can easily fall into the habit of giving stock answers. If I give a stock answer, however, I am operating out of habituation, not presence. I am not really paying attention to the student, how he or she is asking the question, or how the question arises in the context of the student’s practice. A stock answer is not the practice of right speech, even though the answer may be “right” in a technical sense. To cultivate right speech, listen as you talk so that you hear, with your own ears, exactly what you say and how you say it. To travel the eightfold path, we make the same effort in each of eight areas. In addition to bringing attention to how we speak, we bring attention to how we act and behave, to what we do for a living, to the way we direct our efforts in practice and in life, to how we practice mindfulness and cultivate attention, and to how we look at the world and how we think. Fundamentally Buddhism is not a system of beliefs; instead, it is a set of instructions for entering the mystery of being. In the Buddha’s original formulation, these instructions are the eightfold path. The three disciplines — morality, meditation, and wisdom — show how the different elements of the eightfold path interact and provide a clear view of the key elements of practice. The first three elements — right speech, right action, and right livelihood — constitute the discipline of morality. The practice of morality has two aspects. First, by bringing attention to the ways in which we speak, act, and live, we create the conditions needed in order to practice. Second, the way we live is the expression of what we understand through practice. Therefore, in Buddhism, morality is not a matter of observing rigid moral principles, but of giving expression to the wisdom of original mind. Right effort, right mindfulness, and right attention constitute the discipline of meditation. In this context, meditation actually means stable attention. We begin with the effort of resting with the breath. We develop mindfulness first, then stable attention. Attention is the heart of Buddhist practice. Although we use formal meditation to cultivate attention, the real practice is to live in attention all the time. The third discipline, wisdom or understanding, involves right cognition and right view. Right cognition means that we bring attention to the thinking process. We use cognitive processes to uncover and correct problems in our practice and in our lives. Right view is seeing things as they actually are. By bringing attention to how we see things, we step out of the projected “realities” of conditioning.